If you get a few pimples once a month, it’s could be due to your cycle. If you get several pimples each month, it could be caused by your lifestyle or skincare regimen (or lack thereof). 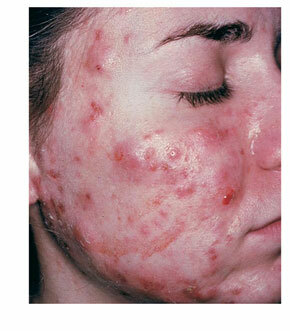 But if you suffer from “undergrounds“, also called cystic acne, it’s probably time to call in the pros. I’m all for DIY skincare, but cystic acne is the type that causes scarring, indentation, hyperpigmentation and if irritated, can seriously spiral out of control. And it almost always has a hormonal connection. Well, let’s face it, most acne strains are the root of some sort of hormonal flux but cystic acne is an indicator of something internal that might require topical or oral medication, and attempts to self-prescribe are never a good idea. How a professional can help. A dermatologist can perform a thorough assessment to better diagnose what’s going on with your body and your skin. A word of caution here: Not all derms are created equal, so if you’re not asked questions about your regimen and lifestyle or what (if any) other symptoms brought about this change in your skin, be leery. If your visit results in 10 minutes of handing out prescriptions sans consultation, run the other way! Been there. Done that. Another wonderful option to determine the root cause of cystic acne is a visit to a naturopath (natural healing) doctor. A naturopathic physician will perform a thorough consultation and suggest natural supplements, alternative treatments, and definitely whole foods as a remedy. Don’t laugh, because you’d be surprised how effective a natural and holistic approach can be when treating a variety of ailments and conditions, from the mild to the severe. Naturopath doctors are AWESOME because they educate and treat the root cause, not just the symptoms by way of temporary meds. Whichever route you take, remember…. treating cystic acne is not something to delay or risk making worse with DIY options. Get thee to a doctor whether conventional or alternative to get it under control ASAP. This entry was posted on November 20, 2013 by suite7beautytalk in Acne, SKINCARE and tagged cystic acne, dermatologist, Naturopath, pimples, severe acne, Skincare.